Soup Season is my favorite season, and THIS one tops them all. 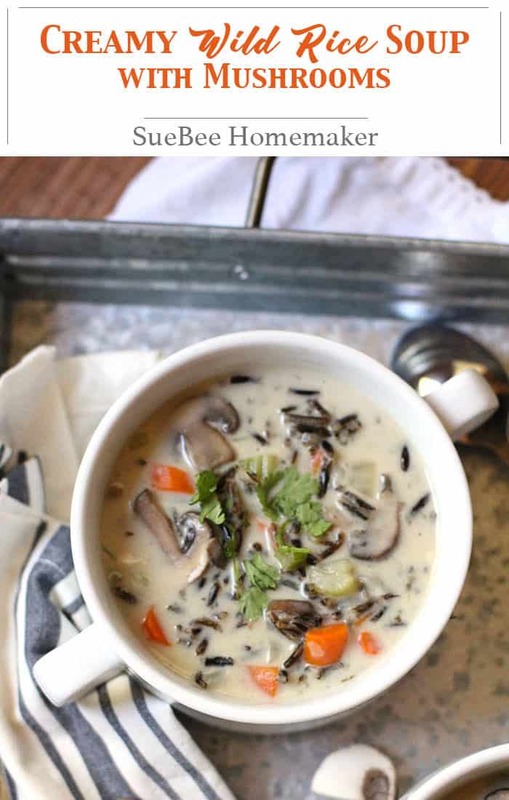 Creamy Wild Rice Soup with Mushrooms has all the good stuff – wild rice, plenty of veggies, and a creamy roux to bring it all together. I’m in love with Wild Rice Soup. The flavors come together to create something wonderful. First off, you need actual WILD RICE. There are plenty of blends out there that have a mixture of wild rice and regular rice, and those are fine. 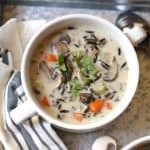 But full on wild rice works the best for this soup because you get that natural nutty flavor, along with a nice firm texture. is the brand I found on Amazon. There are plenty of others, but it is hard to find in the regular grocery stores. You can see what it looks like below – mostly black, as opposed to the blend (that has lighter colors too). One thing I really noticed while cooking the wild rice was the AMAZING nutty aroma. The vegetables I used were the usual soup combination of..
plus mushrooms for this one! I was tempted to use double the mushrooms (because I had them in my fridge), but went with one 8 oz. package. Just right! This is where the creaminess comes from. A simple mix of butter, flour, and liquids (in this case, I used chicken broth, milk, and half and half). You will need to cook it until it thickens. Make sure you have some extra chicken (or vegetable) stock on hand because the rice in the leftovers (if there are any!) apparently continues to grow. You will need to add a little broth before warming it up. Benefits of using wild rice are the following. The nutty flavor is amazing. It provides three grams of fiber in every serving. 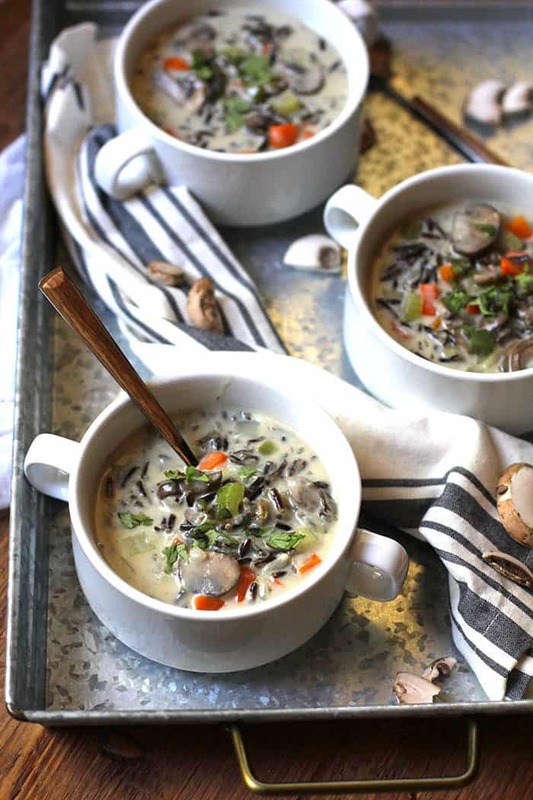 Wild Rice has lots of protein – this soup has five grams in every bowl. 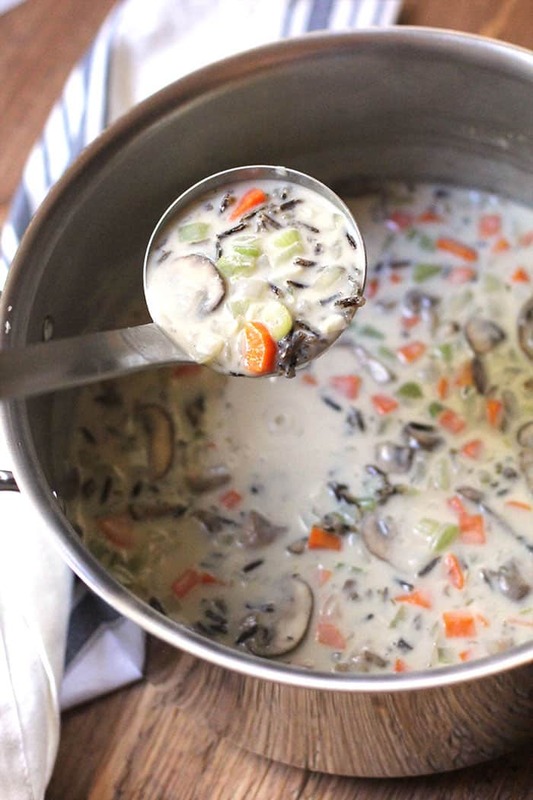 If desired, add chicken to this Creamy Wild Rice Soup for a full meal. You could add rotisserie or cook your own. Either works! Do you need other soup recipe ideas? Here are a few of my favorites. And guess what? They’re healthy! Enjoy soup season. It’s the best. 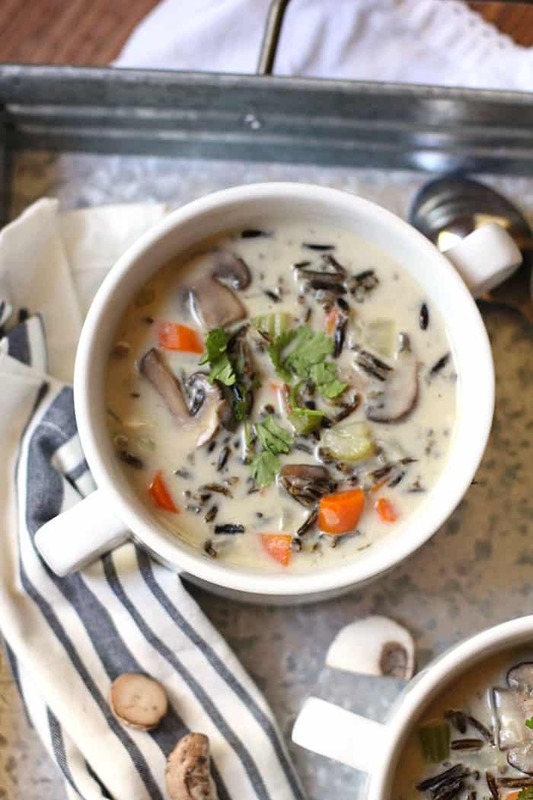 Creamy Wild Rice Soup with Mushrooms has all the good stuff - plenty of veggies, wild rice, and a creamy roux to bring it all together. In a medium stock pot, bring 2 1/4 cups chicken broth to a boil. Add wild rice, and reduce heat to a fast simmer (medium low heat). Place lid on tightly and cook until rice is el dente, or approximately 45-50 minutes (or possibly a few extra minutes). Fluff with a fork. In a large stock pot, heat olive oil and butter over medium heat. Add onion, carrots, celery, mushrooms, and spices (onion powder, rosemary, thyme, kosher salt and pepper). Sauté for 5-6 minutes or until the veggies begin to soften. Add garlic during the last 30 seconds. Then add flour and stir for 3 minutes, to fully incorporate the flour. Add chicken broth, milk, and half and half - and bring to a boil. Reduce heat to a simmer and stir until thickened, approximately 15-20 minutes. Add cooked wild rice to the soup, and let simmer for another 10-15 minutes. Serve immediately with another swirl of half and half, and a sprinkle of cilantro. You'll need to order your Wild Rice on-line, unless you are lucky enough to find it in a store. In the roux, you could change up the ratio of milk to half and half, depending on how rich you like your soup. Keep some extra broth handy, because the rice expands, and your leftovers will need some liquid. Leftovers are great for up to four days! I’ll be making this on Monday! Wish it was today!!! Good morning! Are the amounts listed in the recipe for rosemary and thyme for fresh or dried? I have everything chopped and prepped to make this tonight. Can’t wait! Thank you! I cooked this soup over the weekend. It was outstanding! I’m trying to eliminate dairy from my diet, so I used cashew milk and it was very good! This soup is on the monthly rotation! Yep. 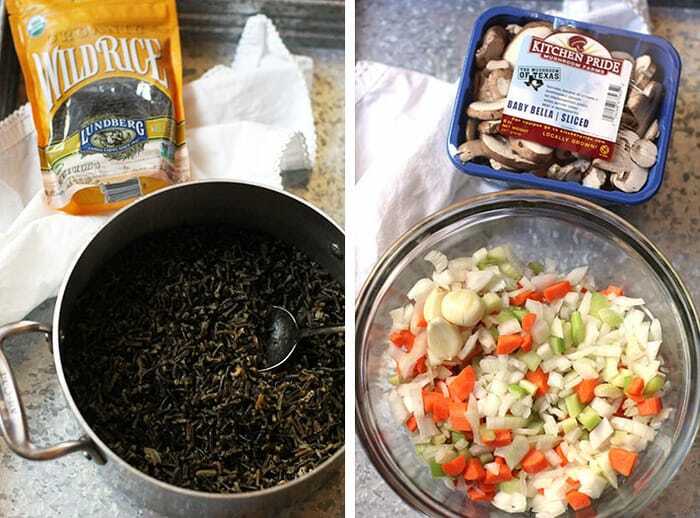 The wild rice is awesome in this recipe. Love the balance of protein and fiber!